An office favorite, Cali Twist from Al Waha shisha tobacco combines the flavors of sweet cherries, tropical pineapple, and citrus orange to create an absolutely refreshing fruit cocktail blend! Combine this with your favorite mint to make it even more refreshing! Manufactured in Jordan with French tobacco leaves, Al Waha has been producing high quality shisha tobacco for years. Their blonde leaf shisha is easy to pack in any bowl or hookah set up and provides smooth, easy to smoke flavors. Because of the nature of the tobacco, it can easily be mixed with other brands and flavors, so get creative and start mixing! 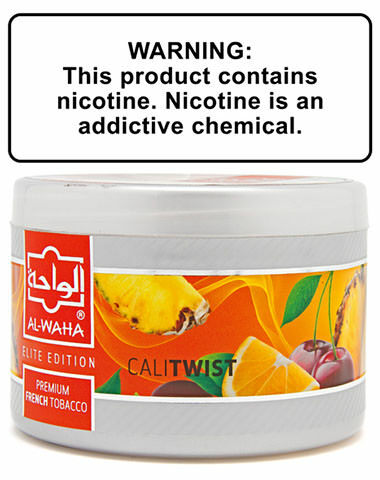 Cali Twist Al Waha Shisha Tobacco has a average rating of 0 stars out of 5 stars based on 0 reviews.